I can remember back in the day, when Obamacare was just a gleam in the of the Democratic-majority congress and GOP Senator Roy Blunt was one of the point persons in the GOP House effort to preserve the status quo of the American healthcare mess. Nor do I remember that he bucked House or Senate leadership, or, more recently, the Trump administration in any of their efforts to destroy or destabilize healthcare delivery to Americans. He, in fact, continues to spout misleading and dishonest claims about the ACA. All of which made me scratch my head in wonderment when I received a couple of glossy mailers touting Blunt, who was on the record as saying a few years ago that he thought Medicare was a mistake, as a “champion of Medicare access,” and as a “healthcare champion.” Whew! Do you, like me, think that somebody’s shoveling some of that old time barnyard fragrance producer that’s so prevalent in the GOP political world? Maybe ol’ Roy heard the folks who were making all that noise when Trump and his collection of more or less ornamental GOP congressional garden gnomes actually went after the ACA last summer. Perhaps, as a result, he’s decided that he needs to make some adjustments to his messaging and cover his tracks. Access for kids who have pre-existing conditions, who would be against that? 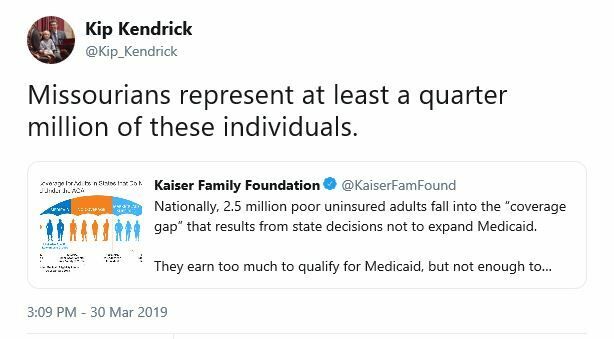 But access for adults, who have done nothing to take care of themselves, who actually will have as I’ve just described every incentive not to get insurance until the day that you know that you’re going to have medical expenses, that’s, that’s a very different kind of story. Since my days in the House, I have supported providing insurance options for people with pre-existing conditions. As we move forward, I’ll work with my colleagues to be sure that no one is denied the care they need based on a pre-existing condition. Admittedly, if you parse this phrase carefully, there’s lots of weasel language. But it’s equally hard to deny that he wants Missourians to believe that he supports the popular Obamacare provision. More importantly, it essentially contradicts his 2010 “personal responsibility” attempt to divert folks from the tragedies that typified healthcare for the millions of Americans suffering from chronic disease – through no fault of their own, contrary to Blunt’s claim. So where does the “tight-lipped” (for a reason) Senator really stand? For instance, has anyone heard him endorse or condemn fellow-GOPer Josh Hawley’s participation in a court fight that would end protections for those with pre-existing conditions? Shouldn’t that be the next test for the wooden-faced guy who talks out of both sides of his mouth so adeptly. Why does the GOP have it in for us? What does Senator Roy Bunt and my Representative, Ann Wagner (R-2), have against me? Or should I really be asking what the Republican Party has against the people of the United States (those, that is, who aren’t billionaires)? I’ve had a chronic illness since 2012. So far Medicare and a supplemental policy have taken care of me. However, the GOP healthcare shenanigans in which Blunt, Wagner, and their partisans indulged themselves these past months could have resulted in my supplemental policy, which pays for a big share of my expenses, being priced out of my reach. For a while it looked like they had decided to give up and leave me be. Killing several million people with a few pen strokes is harder work than it looks – especially when those folks start calling for the heads of compliant legislators. But my relief has been short-lived. We all should have learned by now that the folks who pay the bills for today’s GOP will never rest until the peasantry learn to live with the low expectations that characterize their cohorts in other third world countries. And obedient senechals Blunt and Wagner are no doubt already on point, along with the rest of the Missouri pack of GOP running dogs, as we used to call their ilk back in the old days of the New Left and Chairman Mao’s vastly overrated little red book. As you can see, I and my fellow preexisting conditions sufferers are not the only ones Republicans like Blunt and Wagner want to work over. 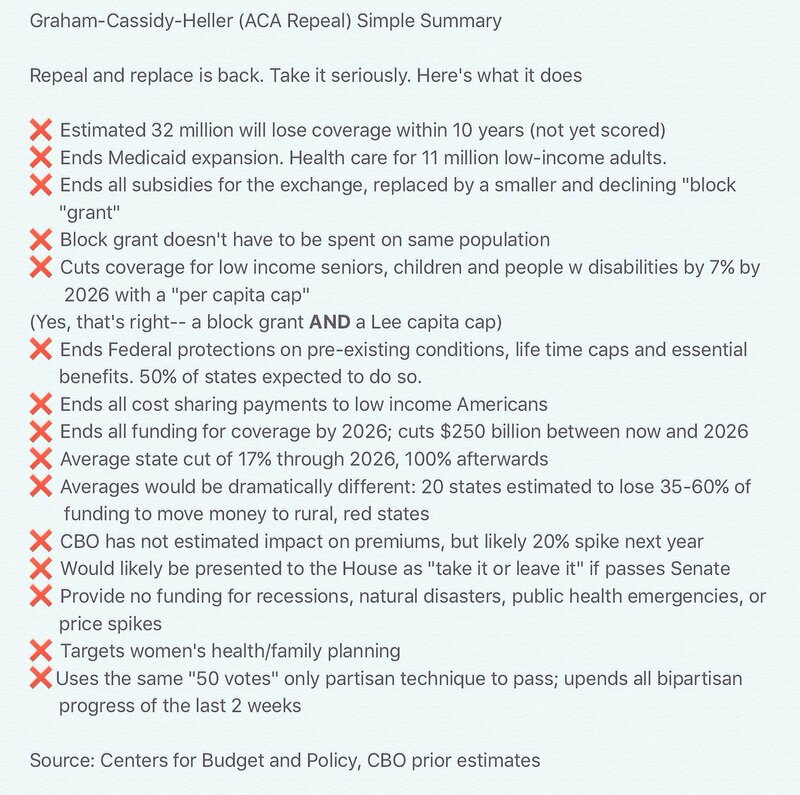 Graham-Cassidy-Heller would do a job on hundreds of thousands of Missourians. And nobody is even talking (yet) about the destabilizing effect on the private insurance industry. Pair this effort to gut Obamacare and drastically peel back healthcare funding by 2027 with the suspicion that Paul Ryan will use Trump’s tax “reform” mantra to further his goal of privatizing and ultimately crippling Medicare, and you’ve got the wherewithal to begin to finance the tax cuts GOP leaders have promised their wealthy patrons. 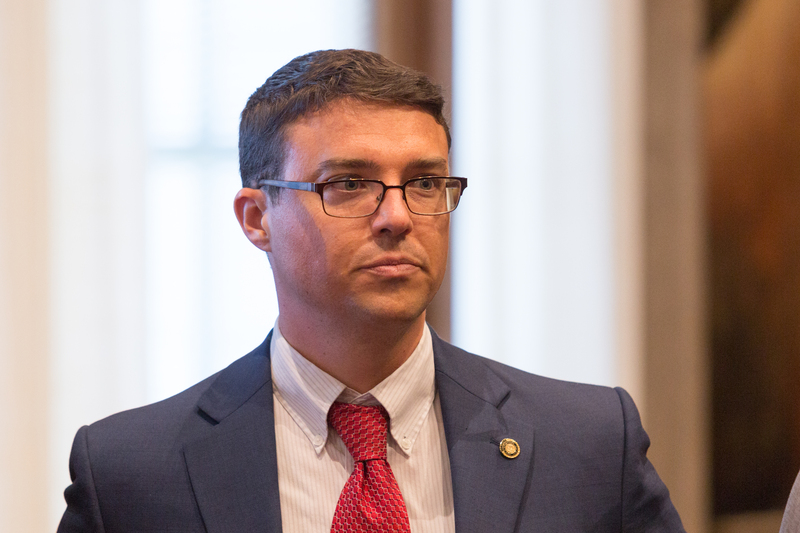 Does anyone believe Blunt, Wagner and the Missouri GOP boyos in the House won’t go along? Even though it’ll leave folks like me out in the dead cold. And I do mean dead. It seems like Republicans in Congress not only want to pull the healthcare rug out from under us, but kick us in oour collective ribs after we’re down. Were we getting a little too uppity what with our Obamacare and all? But maybe I’m wrong. Maybe they don’t have it in for us. Maybe they just think we’re too dumb to notice how far they’re willing to go to give tax breaks to rich cronies. I got the missive below in my email yesterday – Donald Trump’s first effort to come out swinging in favor of Paul Ryan’s Dump and Dupe Obamacare replacement. Notice that the staffers doing the President’s thinking White House’s healthcare PR outreach don’t have much to say about Trumpcare (a.k.a. Ryancare, the American Health Care Act or the AHCA) – which is understandable since the only parties that don’t hold Trumpcare in contempt are the bill’s two sponsors and Paul Ryan – and evidently Donald Trump who tweeted that it’s “wonderful” regardless of the fact that it violates every promise he made to his supporters about replacing Obamacare with something better. It’s been seven years since Obamacare was passed, and now, more than ever, we are seeing the harmful effects of this disastrous law. Obamacare (ACA) insured 20 million previously uninsured people through Medicaid expansion and in the private individual health care market through the exchanges. It enacted a tax on those earning over $200,000/yr that shored up the Medicare system, extending its life by four years at this point – a gain that will be lost if the ACA is repealed in favor of the AHCA which eliminates that high-income tax. Some harmful effects! Obamacare has led to higher costs and fewer health insurance options for millions of hard-working Americans. Independent analysis found 41 states faced higher average healthcare deductibles last year, with 17 states facing double-digit rate increases. Nearly one in five Americans have only one insurer offering Obamacare exchange plans. In just the past year, Obamacare premiums have increased by 25 percent on the typical plan and coverage choices have dropped by 28 percent as insurers have left the market. Obamacare did not negatively affect costs for those who receive insurance through their employers; in fact, it slowed the increasing price trajectory in the pre-Obamacare insurance industry. Premiums were rising by an average of 10% a year before Obamacare – and those who had serious illnesses could be charged considerably more – a practice that Obamacare ended. While premiums for those on the exchanges did increase considerably in 2017, the increase was offset by increased subsidies based on income – and consumers were able to use the exchanges to find competitive alternative insurers. Over 48 million people were uninsured before the major provisions of Obamacare took effect. Those with preexisting conditions can get affordable insurance and don’t face lifetime caps thanks to Obamacare. Seems like things have gotten better, not worse. Americans were promised that Obamacare would bring down healthcare costs — that promise was broken. Americans were promised they could keep their healthcare plans under Obamacare – that promise was broken. Americans were promised that Obamacare would not raise taxes on the middle-class – that promise was broken. The American people want change and President Donald J. Trump promised to repeal and replace this disaster. That is exactly what the President is working with Congress to achieve. Step up and support the repeal and replacement of Obamacare. Obamacare did slow the growth of healthcare costs as we noted above. Its subsidies made insurance affordable for many in the individual market. Politifact rated the claim that Obamacare raised taxes on the middle class “mostly false,” noting that a few minor associated taxes, like those on tanning salons, might affect the middle class. Obamacare had problems to be sure – but in most instances they could easily be fixed if Republican in congress were willing to work in good faith with Democrats to insure the program’s success. Silence can be much more revealing than what a person actually says. Let’s consider Hartzler’s latest newsletter. As we begin the new year, I remain committed to working with my colleagues in Congress to end this disastrous law and to replace it with health care options that offer all Americans access to quality, affordable health coverage they want. I want to consider two other examples. She takes no bow for how much money will be saved from the budget by extending long term unemployment benefits. We can all wonder why. One of the reasons Hartzler cites to replace Obamacare is the following problem. There’s a chance many people who thought they had enrolled in various health care plans are not actually enrolled, after all. Many Americans who signed up through the government exchanges have been incorrectly informed they enrolled in plans. If you’re in this category you might be in for a big shock early in the new year when you learn that while you were informed you had enrolled, the insurance company you thought you had signed up with might know nothing about you. Bottom line – you might not have coverage! This is serious: some of her constituents who thought they have insurance might not. However, she offers NO advice on how to find out whether one is enrolled or not. Nice non-service for something that is important. I am pleased to share that even though Congress was not in session, negotiators from the House and Senate Agriculture Committees were at work hammering out the final details of what I hope will be a comprehensive five-year Farm Bill. There are still differences between the House and Senate versions of the Farm Bill, but the principle negotiators are making significant progress and the conferees plan to vote the first full week back in January. As a member of the House Agriculture Committee, I am committed to serving the interests of both consumers and farmers – approving a Farm Bill that provides the United States with a safe, plentiful, and affordable supply of food for many years to come. We don’t need to note that a significant portion of the Farm Bill will be GOVERNMENT supported crop insurance. What is missing in this good news is any mention of providing Americans who are food insecure with help. (Missouri has the highest percentage of people who are food insecure in the country.) There was a time when the Farm Bill had such support. What Hartzler doesn’t say is much more important than what she says. Pre-filed December 9, 2013, and ordered printed. Submitting to the qualified voters of Missouri, an amendment to article I of the Constitution of Missouri, relating to state sovereignty. Section 35. 1. That the state of Missouri hereby enforces its constitutional sovereignty and the sovereignty of its citizens under the Tenth Amendment to the Constitution of the United States of America over all powers not enumerated and delegated to the federal government by the Constitution of the United States of America, nor prohibited by it to the states. (3) Interpret the Constitution of the United States of America based on its language and the intent of the signers of the Constitution at the time of its passage. The several amendments shall be interpreted by their language and the intent of the congressional sponsor and co-sponsors of the amendment. Any interpretation of the Constitution based on an emerging awareness, penumbras or shadows of the Constitution, a theory of the Constitution being a “living, breathing document”, or any interpretation that expands federal authority beyond the limited powers enumerated and delegated to the federal government, without an amendment to the Constitution, shall be deemed to exceed the limited powers enumerated and delegated to the federal government. 3. Missouri citizens shall have standing to bring a cause of action to enforce the provisions of this section. Enforcement of this section shall apply to federal actions taking effect after approval of this section by Missouri voters, federal actions enumerated herein, and any federal action, regardless of its effective date, the general assembly or Missouri supreme court shall hereafter determine, in accordance with subdivision (3) of subsection 2 of this section, to exceed the powers enumerated and delegated to the federal government by the Constitution of the United States of America. (3) “Constitution”, the Constitution of the United States of America. 5. The provisions of this section are self-executing. All of the provisions of this section are severable. If any of the provisions of this section is found by a court of competent jurisdiction, in compliance with subdivision (3) of subsection 2 of this section, to be unconstitutional or unconstitutionally enacted, the remaining provisions of this section shall be and remain valid. Any ruling by a court of competent jurisdiction in violation of subdivision (3) of subsection 2 of this section shall be invalid and not recognized, enforced, or otherwise furthered in the state of Missouri. Just call it a feeling, but this is going to be the most productive legislative session ever. Not.